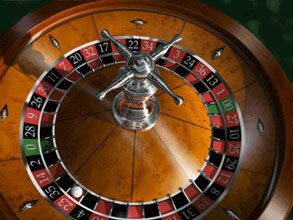 Roulette is a famous gambling game of chance, which is widely presented in different variations in both land-based and online casinos all over the world. The main and inherent element of the game is considered to be casino roulette wheel, which is made of fixed bowl and movable disc inside the bowl. There are 37 or 38 slots located on the wheel, each of which is associated with certain number from 1 to 36, zero or double zero position. All the wheels should be balanced perfectly in order to exclude the possibility of cheating as from the dealer's side, so from players' one. Nowadays casino's owners check carefully for different wheel's imperfections owing to the fact that some careful gamblers could reveal biased wheel and then exploit such defects in their own favor. There are mainly two most common roulette game variations, which are notably European and American plays and which are different in terms of the quantity of zero pockets and all ensuing consequences. European roulette provides only one zero slot while American game involves also double zero position, which leads to higher house edge and casino's advantage over gamblers than single zero game offers. Considering the fact that the number of slots is the main factor, which determines online roulette probability of winning, it is highly recommendable to choose to play European or French roulette plays instead of less favorable American one. There are also other roulette game versions like Biloxi Roulette or Atlantic City Roulette, but the difference in rules for the plays is usually determined by casinos itself while roulette wheels used are the same as we describe in the next section. Each of the slots on roulette wheel is colored red and black in succession while the numbers are located according to certain systems in such way that the balance between odd/even, high/low numbers is strictly obeyed.